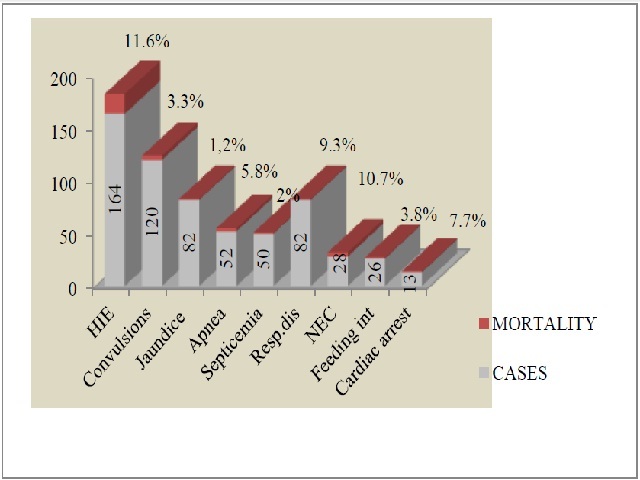 International Journal of Research in Health Sciences,2014,2,4,1064-1071. 1-Associate Professor of Pediatrics, Govt. Medical College, Ananthapuramu, Andhra Pradesh, INDIA. 2-Associate Professor of Gynecology and Obstetrics, Govt. Medical College, Ananthapuramu, Andhra Pradesh, INDIA. 3-Assistant Professor of Medicine, Govt. Medical College, Ananthapuramu, Andhra Pradesh, INDIA. Background: Birth asphyxia is a major cause of neonatal morbidity and mortality. Objective: Study is intended to determine the incidence of birth asphyxia and its immediate outcome in relation to risk factors and complications. Materials and Methods: Cross sectional study. Setting: Tertiary care teaching hospital. Patients and methods: 364 term neonates delivered and admitted in neonatal intensive care unit of our institution with APGAR score of <7 at one minute were enrolled in this study. The maternal and neonatal data was recorded according to predesigned proforma. All these neonates were resuscitated as per the need according to the guidelines of neonatal resuscitation program by American Heart Association (AHA) and were followed up till death/discharge and the data was analyzed. Statistical analysis: Chisquare test. Results: The incidence of birth asphyxia was 6.6 percent and the mortality was 17.8% percent. Male to female ratio was 1.4: 1. Statistically significant maternal risk factors were primiparity (54.9% in cases vs. 35% in controls) hypertension (18.1% vs. 4%), toxemias of pregnancy (25.3% vs. 15%), antepartum hemorrhage (6.9% vs. 0%), prolonged rupture of membranes (PROM) (35.2% vs. 5%), prolonged second stage of labour (37.4% vs. 4%) and Oxytocin use during labour (18.7% vs. 0%). Serious neonatal complications observed were hypoxic ischemic encephalopathy (HIE) (45.1% vs. 0%), convulsions (32.9% vs. 3%), apnea (14.3% vs. 2%) and necrotizing enterocolitis (NEC) (7.7% vs. 0%). Conclusions: Maternal risk factors and neonatal complications were significantly higher in asphyxia cases.